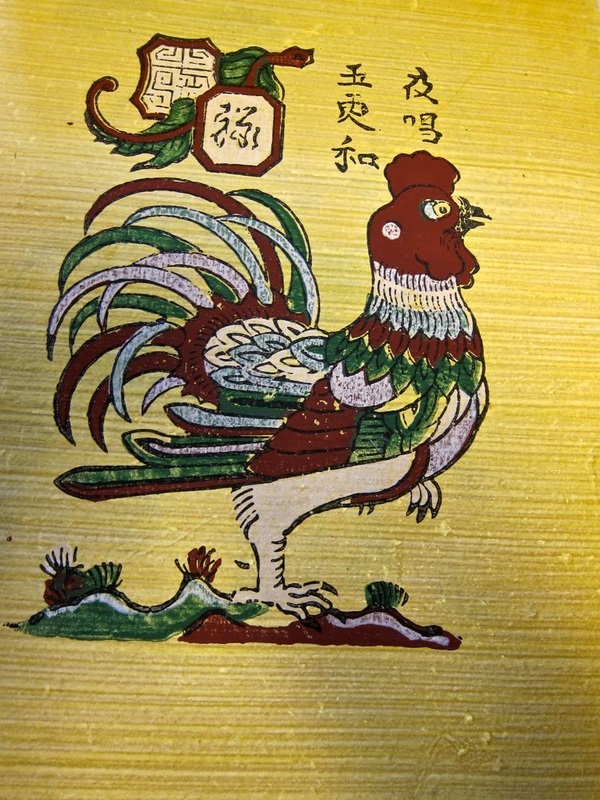 ​Folk painting like the one in Dong Ho is a celebration of traditions. In Vietnam, it keeps village life alive in people’s memories while the invasion of industries draws people in the cities. It is a reflection of what the artist actually sees not what she imagines. In that sense, it is a backward looking art resting on history not modern art explorations of twisted visions in the artist’s mind when he looks at something or feels something. Dong Ho Painter Nguyen Dang Che. Copyright: aesta1. Dong Ho's pride is the family folk painting gallery of Nguyen Dang Che, a celebrated artist revelling in depicting the joys of small village life. Through both paintings and wood block reproductions, he and his family create work that is really worthwhile bringing home from Vietnam. When you travel, you should always try to bring home the best that you can afford of countries you’ve visited. ​Nguyen Dang Che’s art is among the best. Che himself is a small man filled with energy, working closely with his 4 sons and daughter. Each family member seems to have a task in producing the prints and paintings. 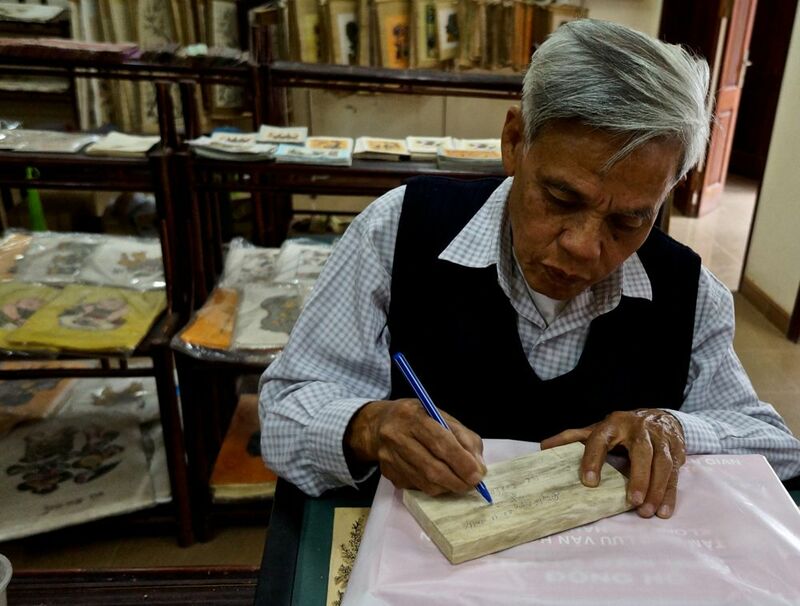 The technical skill in cutting the wood blocks for the prints is a delight to watch. Dong Ho families still own many of these traditional blocks used for folk painting. This village used to be the centre of folk painting which is popularly used by the Vietnamese to wish happiness, good luck and fortune during TET, the Vietnamese New Year. 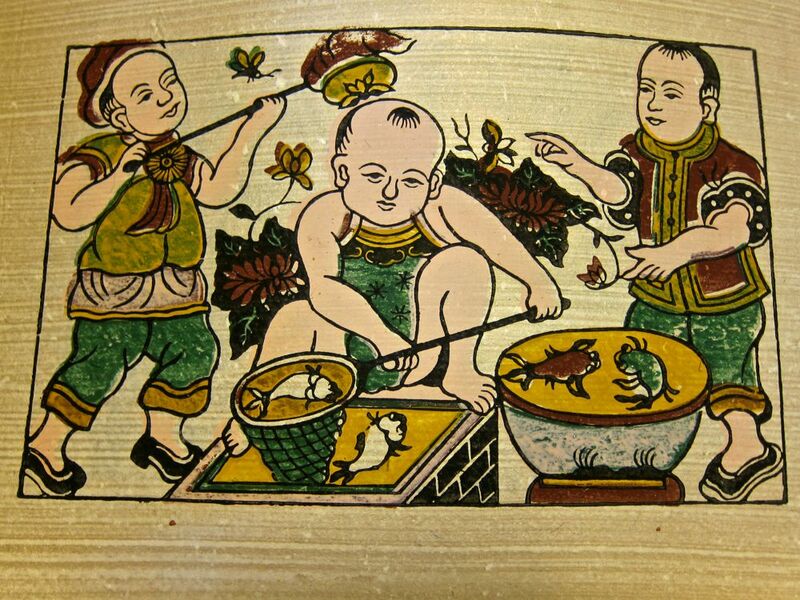 In the past, just before TET, the village used to hold in its communal house a market for its folk paintings. 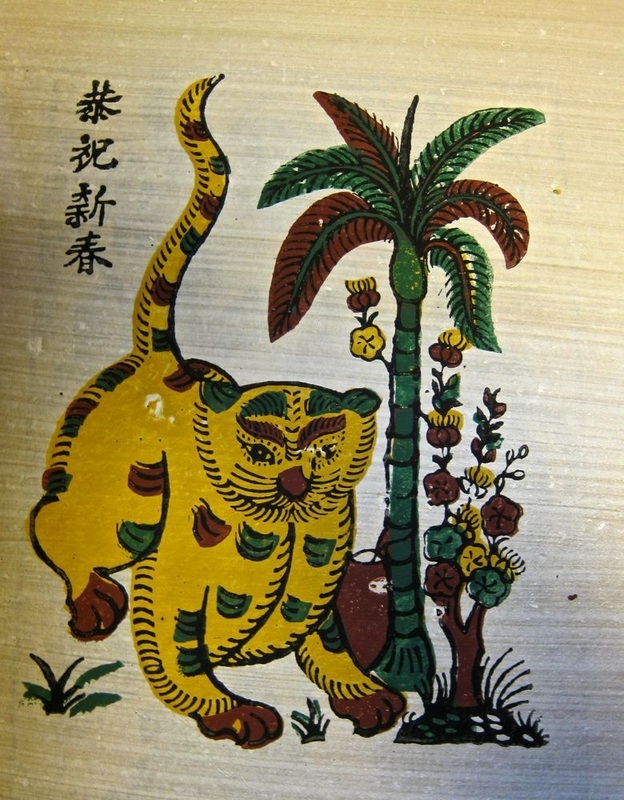 Dong Ho folk painting is made on the traditional paper from the bark of a tree, Dzo. It is wonderfully textured and helps focus on the quality of the over-all effort. 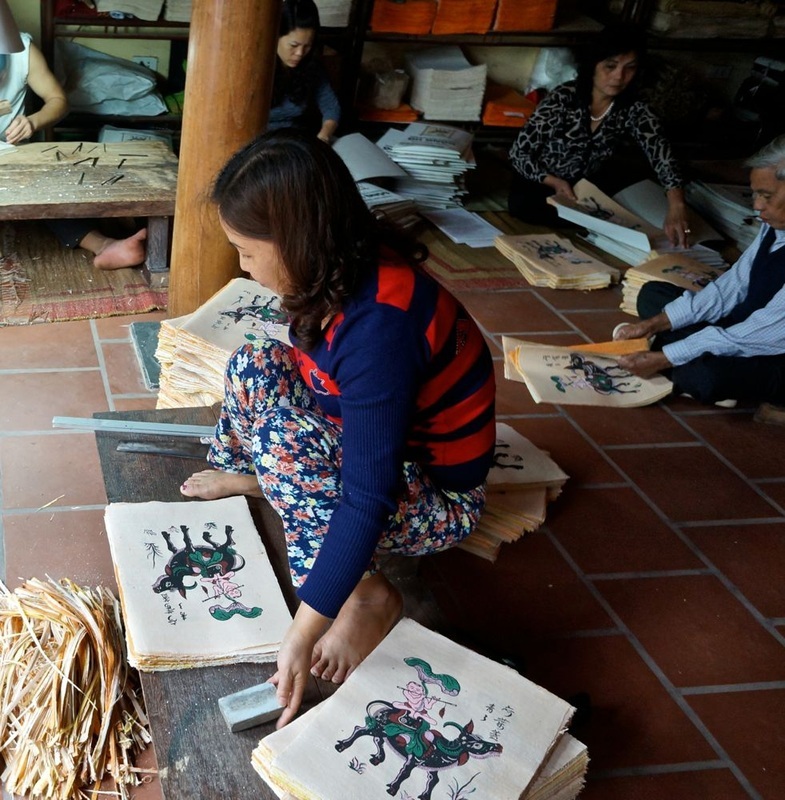 It is made from the fibre of the bark of a papyrus like plant coated with oyster shell dust called "diep" by the locals. The Thai minority in Vietnam were the first to make this type of paper and still continue to do so. 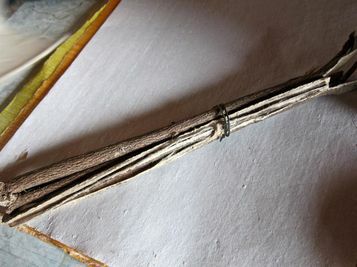 Originally, it was only used for writing poetry until the Dong Ho families discovered that once coated, it is perfect for folk painting. The mixing of colours of traditional herbs, tree leaves, charred bamboo, ground oyster shells and red earth is an art in itself. To protect the finished painting, the painters cover it with a layer of "ho new", a sticky rice paste. 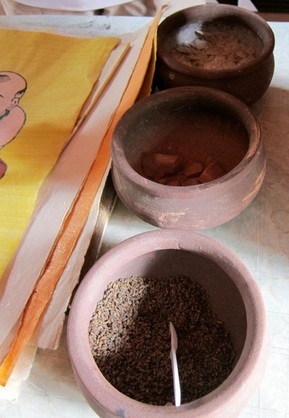 You can see in Nguyen Dang Che's workshop all these traditional items used for folk painting. The grounds where Che paints have traditionally built workshops and are of themselves worth a visit to see the village craftsmanship that has remained largely unchanged for a thousand years. Filled with light and warmed by the wood, it’s a perfect setting for an art community. Dong Ho is next to a river, the Duong, and is a verdant and fertile village giving the feeling of timelessness. Village markets are perched precariously on bridges and along the road with all the seasonal fruits and vegetables being eagerly promoted by cone hatted farmers. So visiting Che and his family is a great experience that includes not only the final art work but also a quick peek into the hundreds of years old village life that forms the basis of the craft. 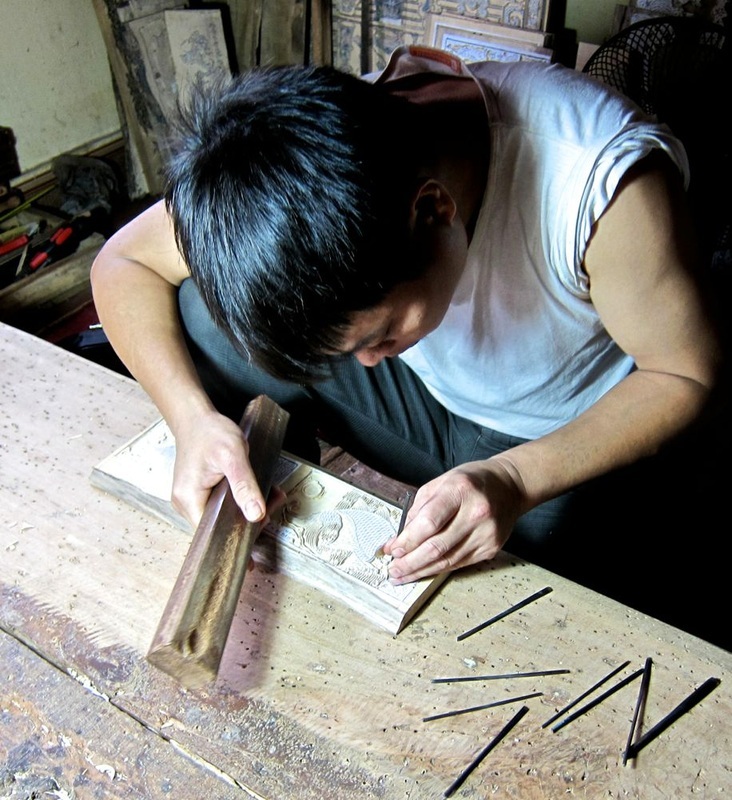 A little more than an hour from Hanoi, it’s really a half day’s visit and if combined with the famous duck lunch in Bac Ninh, it will be an experience you’ll remember well each time you look at Che’s wood cut or painting on your wall. Located 30 km. from Hanoi, along the Duong River, Dong Ho or Mai Village is in Song Ho commune in the district of Thuan Thanh in the province of Bac Ninh.